The vibrant colours of summer! It just doesn’t get any better! There are so many reasons why I might pick a particular recipe for my blog, but today’s recipe simply came down to the glorious colours! From the very moment I laid my eyes on this recipe in Whitewater Cooks with Friends by Shelley Adams, I felt compelled to recreate this show-stopper in my own kitchen. This salad is destined to become the centre-piece of any barbeque or buffet you will have this summer! Just search out the freshest ingredients to make the flavours really sing. I had to do a bit of searching for the striped beets, but I was ecstatic when I found them in my local organic market. As I was putting it all together, I realized that the ingredient list is pretty flexible. Find your favourites berries and fruits and piece them all together on a colourful platter. Creating this dish reminded me of quilting – arranging the colours in the most attractive fashion. Since I want to share the abundance of summer with my Fiesta Friday buddies, I have decided to bring a lovely large platter of this salad to the party! Thanks again to our generous host, Angie @ The Novice Gardener for organizing the best blog party in the blogosphere and to the co-hosts who are there to make the party run smoothly, pour the drinks, keep the music happening and make sure that we all get a taste of everything! You guys rock! In a large salad bowl or plate, layer the salad ingredients in an attractive manner. Combine the salad dressing ingredients in a blender and process until they are incorporated. Drizzle the dressing over the salad just before serving and toss gently. Enjoy the bliss of summer in every bite! You can substitute whatever summer fruit or berries you love. Just enjoy the abundance of the season. Don’t you just love the colours of summer? Aha Jhuls! You see the method to my madness, don’t you! I just can’t get any thing past you 😉 You have fun too! See you in the pool? This just looks sooo perfect, love all the different colors. That salad yells fiesta Chef! Just gorgeous colors. Love it. Another thing I loved in your salad is the addition of sumac. How creative is that :). Omg, what a showstopper indeed! Amazing colors and presentation, Julianna. This would be the first dish I run to at a dinner party! Happy Friday! 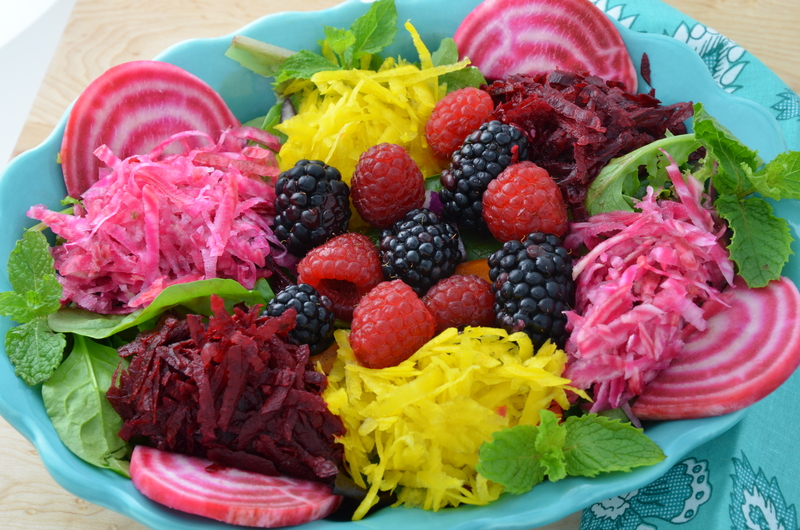 What a wonderful, colorful salad! Julianna, this really is a showstopper of a salad and just perfect for our pool party too! The vibrant colours are just stunning and perfect shown off in that blue bowl. I love the flavours you have going on in the salad dressing – sumac, honey and raspberry vinegar sound just perfect! Thank you so much for sharing this with us – Happy Fiesta Friday! 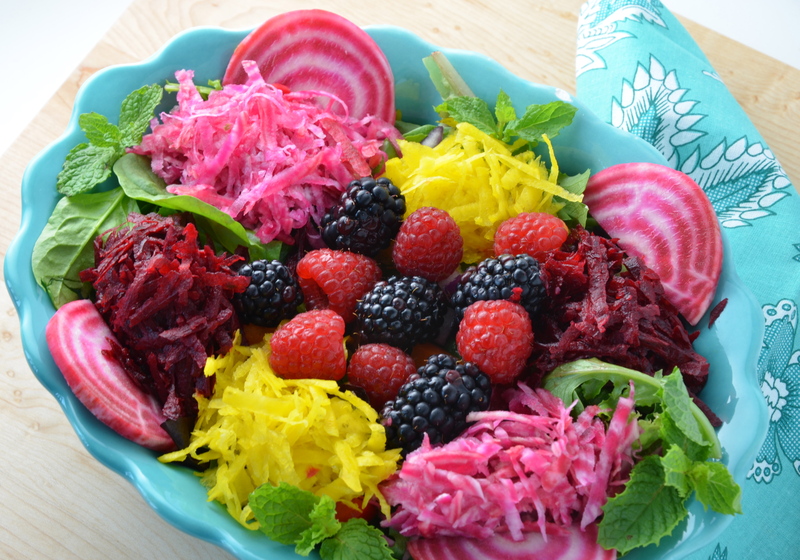 What an amazingly colorful salad!..I’m sure it tastes as good as it looks. That salad is a work of art, almost to beautiful to eat but then all the ingredients are so delicious how could you not. Delightfully colorful, healthy and inviting. Thanks Chitra! Yes, I can never eat enough salad in my life, but especially in the summer with the hot weather! Oh, thanks so much, Judi! I saw these gorgeous beets in a blog post last year and decided to try my luck. The snails devoured most of the greens but I may have something beneath the soil in a couple of places. Dare I look? Oh so pretty Julianna – what a gorgeous dish to adorn the table! Thanks Margot! I just can’t get enough of the colours of summer! 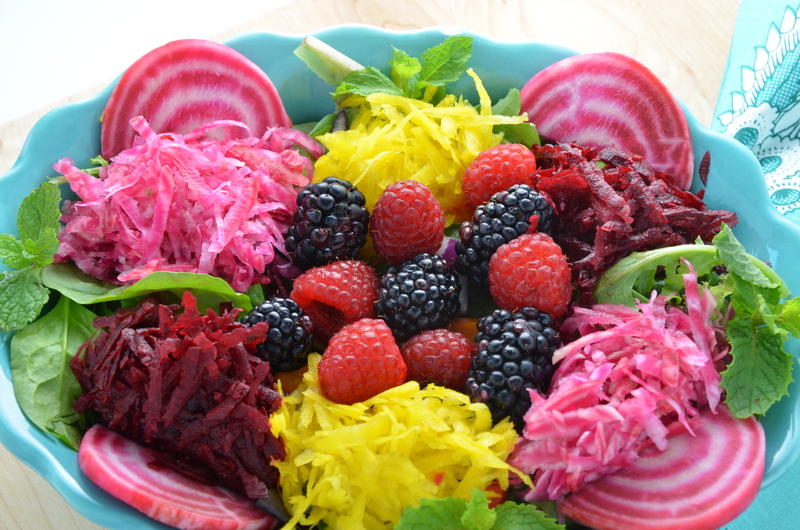 What a beautiful and colorful salad, Julianna! WOW ! What great colours … and what a creation ! The mint and basil from your garden ?? Hey Les! Thanks for the lovely comment! I wish that the herbs were from my garden, but no, I bought them at a great veggie market not far from me! It is a real celebration!! I love the wonderful flavours and colours! Just beautiful!!! What a beautiful salad, probably the prettiest I have seen. Salads can be healthy and gorgeous too! This one certainly is proof of that. I’m putting the ingredients on my grocery list for this week. Thanks to Chef Julianna for sharing this great late summer recipe. Yummmm…..
Wow, this is gorgeous!!! Beautifully presented, and it sounds delicious! Thanks so much, Linda! I appreciate it!